The first time I saw Genevieve, I was struck by the delicious contrast of this spunky, pixie-ish slip of a woman who was un-chaining a very lady-like pink bike (think sweet sherbet rattler with handle bar tassels and spokey–dokeys) while strapping on this shiny black helmet with pimp-gold “Notorious E.V.E” detailing. Like teaming army boots with broderie anglaise. 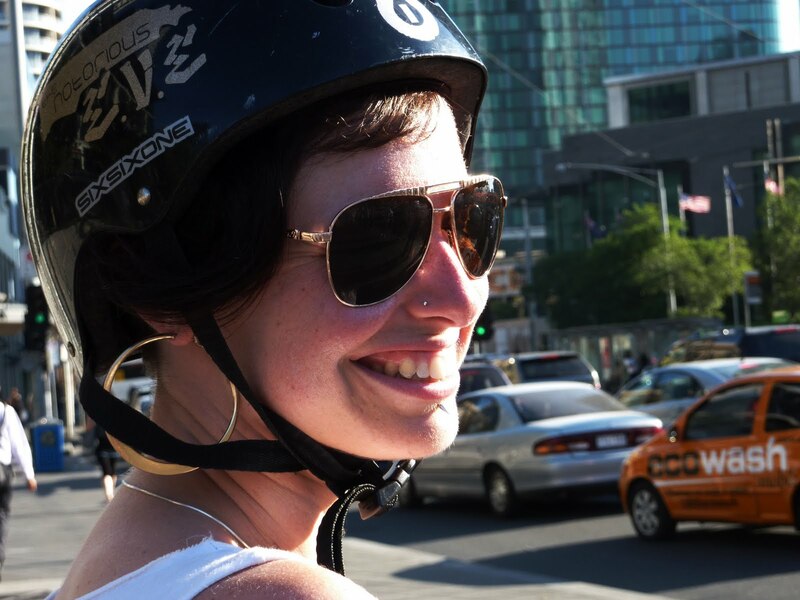 Genevieve was one of the first people I approached about my helmet problem/thing and she was remarkably encouraging. She even mentioned that a couple of fellows at Ray’s had, in fact, very recently held a customised bike/skate helmet exhibition. I was too shy to take her photograph then. And again too shy when I ventured into the coffee den to ask the boys about their helmets, but the seed had been sown. Now that I’ve met Genevieve a couple more times, I know that this is exactly the sort of fabulous contradictory vibe that you get from her. Fitted out here with the retro sunglasses and the “yo mama” hoops, I feel this helmet is getting its proper dues for sure.